It is extremely important to keep careful records of plant names to avoid confusion. 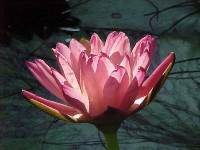 A goal of WGI is to assist in this international endeavor by providing a Registry of Waterlily (Nymphaea) Cultivars. WGI has accepted as its Preliminary Checklist Victoria-Adventure.org's Named Waterlilies. In addition to providing this Register and Checklist online, WGI has printed its Register and Checklist of Nymphaea (Waterlily) Names. This is to satisfy the requirements of the ICNCP (International Code of Nomenclature for Cultivated Plants) of print, rather than electronic, publication to "establish" those names in the Register which have adequate descriptions. Applications for Registration can be sent at any time and will be put on the web site promptly. The deadline for inclusion in the printed 2009 Register Supplement is December 20 and it will be published early in January 2010. New Registrations received after that date will be included in the 2010 Supplement. Each accepted application receives a full page on the WGI web site complete with the images that accompany the application. It will also be added to and linked from the online Register and the images will be included in the extensive Victoria-Adventure Image Galleries. There is no charge for applying or for inclusion in these online resources. The text of each application will appear in full in the print version of the 2009 Register Supplement with one color image free of charge to the applicant.